The scope of IMO-mandatory ARPA continues to grow. In the near future, ARPA will be required on all larger vessels. The only variable is when. True motion. 9 relative motion target markers for collision avoidance monitoring. Modular Design: Economy without Compromise. RM (Relative Motion) 1690 Radar 16" display. Clearscan® videoprocessing for best picture in foul weather. ing Master Radars... and ships... running. 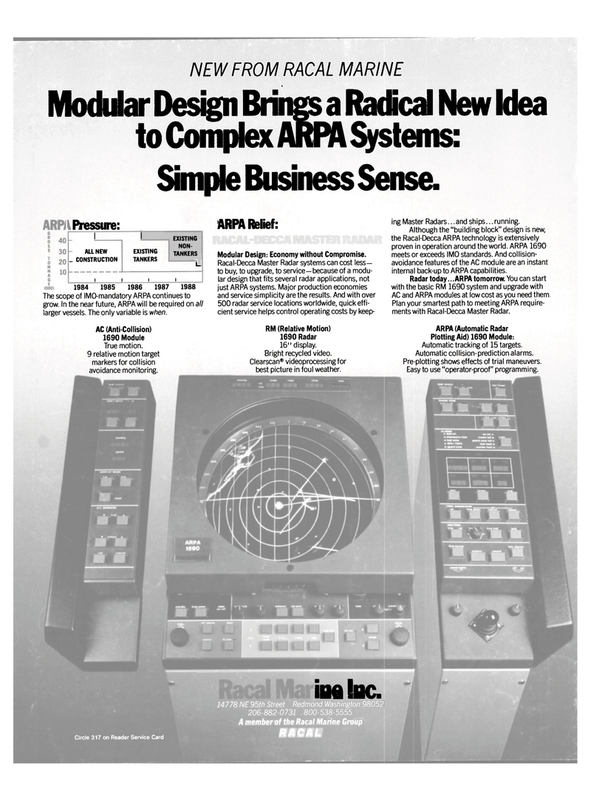 Although the "building block" design is new, the Racal-Decca ARPA technology is extensively proven in operation around the world. ARPA 1690 meets or exceeds IMO standards. And collision- avoidance features of the AC module are an instant internal back-up to ARPA capabilities. Plan your smartest path to meeting ARPA require- ments with Racal-Decca Master Radar. Automatic tracking of 15 targets. Pre-plotting shows effects of trial maneuvers. Easy to use "operator-proof" programming.